Not so long ago I was writing how much we like chicken filles stuffed with goat cheese and prosciutto. Well here is another version of this dish and what is really particular about it, is that it utilises amaretto to create really fragrant, delicious sauce. When I saw it on lol foodie I immediately knew I have to make it. Combination of amaretto, chicken, goat cheese and cured ham sounded peculiar and I knew it will be delicious. I decided to change the recipe slightly, I used shiitake mushrooms from Lapland and made the amaretto sauce based on cream instead of stock. I served the chicken with mashed potatoes and honey roasted root vegetables. It was a really memorable dish and definitely we will be making it often. 1. Season both sides of the chicken filles with salt and pepper. Spread each chicken breast half with 2 tbsp of goat cheese and top with 1 slice of prosciutto. Roll the chicken into a tight cylinder. Tie with kitchen twine or bind with skewers. 2. Melt 1 tbsp of butter over medium-high heat in a pan. Add the mushrooms and cook until softened, about 5 minutes. Remove the mushrooms to a plate, and set aside. 3. Dredge each chicken “roll” in flour. Add the remaining butter to the pan. Once melted, add in the chicken rolls. Fry for several minutes turning the rolls from time to time and in the meanwhile keeping the pan covered. 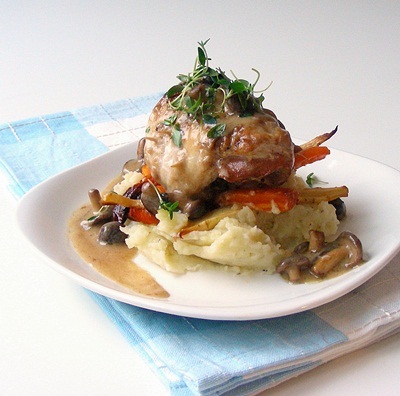 Remove the chicken to the plate with mushrooms. 4. Take the pan off the heat. Add the cream, chicken broth concentrate and bring the pan to the heat. Bring it to the boil and scrape to deglaze all the bits from the bottom of the pan. Add amaretto and simmer for 5 minutes, or until the sauce has reduced. Return the chicken and mushrooms to the pan, turning to coat in the sauce and heating through. Serve with chopped thyme. This entry was posted in Meat, Poultry and tagged amaretto, chicken, food, goat cheese, mushrooms, prosciutto, sauce, thyme by No Onion Please. Bookmark the permalink. The picture alone makes me want to try this! omg I am glad I didn’t miss this one. That picture looks amazing and I am a huge Amaretto in all food fan! Love this dish will try and add to my list! Bravo! I just printed out this recipe and plan to make it soon. Your plate looks like this dish came from a 5 star restaurant. Beautiful.